The screens can bend thanks to plastic instead of glass on the back. One of Apple's main screen suppliers, Japan Display Inc. (JDI), has revealed a 5.5-inch LCD smartphone screen that can be bent like OLED displays from Samsung and LG. While not quite as flexible and thin as OLED, the "Full Active Flex" 1080p screen could be used in phones with curved screens like the Galaxy S7 Edge, the company told the Wall Street Journal. LCD is a lot cheaper than OLED, so you could see a lot more curved phone designs when it starts manufacturing the panels in 2018. 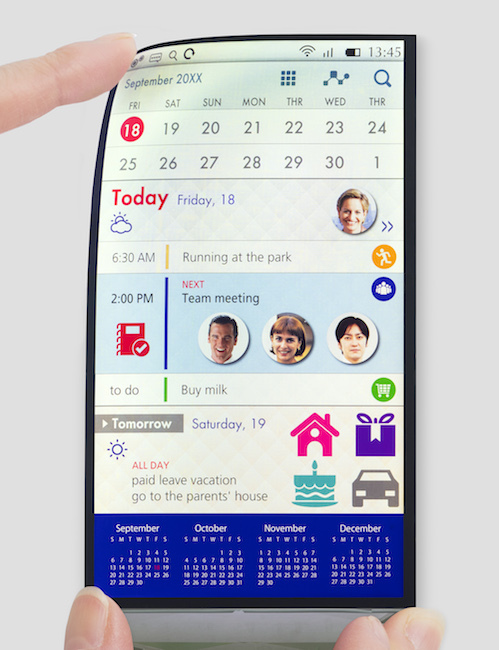 Since LCD displays usually have a glass backing, it's been difficult to curve them until now. Japan Display got around that issue by using plastic for both side of the liquid crystal layer. That allows not only a flexible screen, but could also help "prevent cracking from occurring when the display is dropped," the company said. It also hopes to adapt the screens for other products, including car displays and laptops. Japan Display also told the WSJ that it has launch customers for the screens, though it wouldn't say whether Apple or any other company was among those. Rumors of an OLED iPhone have been bubbling up recently, but some analysts think that all the OLED suppliers combined couldn't meet Apple's needs until at least 2018. If Cook and company decided to try curved screens, however, the LCD models from JDI now give them a future option besides OLED.